Just let me say it….. I love Netbooks. Just the convenience factor, price point, battery life and decent performance combined make it a perfect 2nd computer for enthusiasts and a great tool for lower income groups to get started with computers. I believe schools could benefit a great deal from them too thats to the price point. I have always been one for mobile computing and that started off with the whole PDAs of yesteryear (Pocket PCs, Psions and Palms) that has morphed into smartphones of today (too bad I did not try the MessagePad/Newton though I did see it behind the glass display when I visited Labuan). Did you know that the Symbian OS (now Symbian) that is on almost all Nokia smartphones has it’s history in the Psion PDAs? But I digress. Now on to the reason why you should get a Netbook. When compared to regular laptops the sheer convenience is apparent. The first thing to note about a netbook is that it is compact and light. It lets you put it in your bag and not even notice that it is there. That may even be enough for some, who lug around their laptops that they have been using for a year or so and have dismal battery life thus being limited to places where you can use it as you are always looking for a power point to plug in and charge. This brings me to the second great thing about netbooks: the outstanding battery life. The Toshiba NB200 can run for over 9 usable hours! Heck I bet the average netbook would beat out the average laptop on battery life. More functional in display size/resolution and due to it having a full operating system. A larger screen with larger resolution lets you surf webpages with ease and provides the full web experience together with Flash. You can also easily enjoy your movies or videos on the large screen without straining your eyes. A full operating system means you won’t be tied down to the limitations of a trimmed down phone operating system and typically with a keyboard you will certainly be able to get more work done more efficiently on a netbook compared to a phone. When I got my first laptop it was over B$3000. Now you can get relatively good laptops for B$1500 but netbooks differentiate themselves by being mostly being under B$1000 (starting from B$600). Within my group of friends that I know have laptops, they end up non-functional after the 3rd year (motherboard failure, graphics failure, mechanical failure i.e. falling apart, etc) which makes me wonder if it really is worth spending all that money just to see it disappear once the device stops working. Most netbooks will be even be cheaper than smartphones that won’t match up to work functionality of a netbook. Netbooks are great for those mobile warriors that are limited by their phone offerings or the weight of the laptop that requires constant charging when on the go. Netbooks are great for students who need a mobile computer to do their school assignments. The sheer convenience of a netbook must e experienced. I miss my Acer Aspire One as I use my Macbook Pro now: the AA1 was so much more convenient but I had to switch to a proper laptop as the netbook could not keep up with my needs as a heavy power user when I work (for the typical work scenario of Microsoft Office usage and browsing the web it will be more than fine). For other aspects of my AA1 usage, it is still great. Now netbooks are not perfect and you should find out the things you need to know about netbooks before getting one. Also now the lines of netbooks and laptops and sublaptops are blurring with products like the Acer Timeline series that brings laptops to a better standing with good battery life and lighter weight and also with netbooks getting larger (11 and even 12 inch screen). At the end of the day: know what you need, know what the offerings can give you and make the best choice for your needs. Netbooks have been in the market for about 2 years now and I believe they have been a game changer to many. In essence netbooks are smaller, lighter and cheaper compared to notebooks and run on a slower performing processor but get good battery life (4+ hours with some going for 9+ hours). Starting at a cost of ~B$500 they can go all the way up to over B$1,000. Netbooks aim to be a cheap and usable computer for consuming media and as the name suggests to use on the Internet and for cloud computing where you store all your data in the cloud (i.e. the Internet). While it may have started off with smaller solid state drives (SSDs) that didn’t have much drive space, thus forcing users to store they data in the cloud or a USB drive, it is no longer the case and they have regular hard drives similar to notebooks so this is a non-issue. Netbooks currently mostly run on Intel Atom processors with some running Via C7 or Via Nano processor and future netbooks are being manufactured to run on ARM. While these processors may not be as fast as a Core 2 Duo or a Corei5, they are sufficient for most tasks but their performance will falter at anything CPU intensive, most notably HD Flash video playback / Photoshop filters / video encoding. For now I would say stick with Atom N Series processors (N280 is more preferable over the N270). The Z series were made specifically for Mobile Internet Devices (MIDs), similar to an iPod Touch, that needs to consume even less power to increase battery life due to their even smaller form factors. Z series Atom processors provide better battery life, but for the typical netbook it hinders performance. Netbooks typically have 10.1″ displays with a resolution of 1024×600. 1024×600 is a resolution smaller than the 1024×768 which could be considered the ‘lowest’ modern resolution which applications and webpages are designed for. So a typical netbook may have issues with applications that use too much of the screen space: a majority of applications are fine but may need some tweaking to free up more usable screen area by doing things like hiding toolbars. Websites are typically not designed for these smaller resolutions screens and you can find yourself getting frustrated with the small area of actual webpage content that you are able to see. There are ways around this as some netbooks have a feature to set the resolution to 1024×768 or higher but with the panning feature where you place the mouse cursor at the end of the screen and the whole desktop will move in that direction revealing the ‘missing’ resolution. Some netbooks have 1024×576 displays and isn’t much different from the default 1024×600 but with a height of 600 pixels, users will already have screen/desktop real estate issues, and having 24 pixels less height will make this problem even worse. Quite a few netbooks come with the option to have a HD screen with a resolution of 1366×768 making applications and web pages much more usable at the expense of making the text smaller. Text size can be increased at a system level for applications; and for web sites, web pages can be zoomed and there are ways to optimize the browser for netbook use. I have an Acer Aspire One 150B with a 8.9″ screen with a resolution of 1024×600 and indeed the default system text is small thus I would recommend at 10.1″ display for a resolution of 1024×600. I think the Acer Aspire One 751h 11.6″ display with a resolution of 1366×768 is has a great display and resolution combination. If you’ll be typing quite a fair bit on your netbook you will have to try the keyboard out. Sometimes it is not just the size of the keyboard that matters but the placement of the buttons. Look out for placement and size of the keyboard keys. The tilde (~) key is sometimes placed weirdly and the size of the comma (,), period (.) and slash (/) keys are sometimes made smaller and can be usability issues. On a Dell Vostro 12″ that my church has, which isn’t even a netbook, the comma, period and slash keys are smaller than the other keys and I cannot touch type properly at all. Even my Acer Aspire One 8.9″ has a bigger keyboard with keys of the same size. If you use the cursor keys, check the surrounding keys, some netbooks have “page up” and “page down” keys are on either side of the up arrow key, which leads to accidental presses instead of the left/right arrow keys. Look for size, button placement and tactile feedback. The Acer Aspire One 8.9″ suffers from a small trackpad and weird button placement: left mouse button on the left of the trackpad and right mouse button on the right of the trackpad. Though it has a nice feature of being able to assign each corner of the trackpad to a different function (I have mapped the lower left corner to be recognized as a right mouse button press) it is just way too small for proper use. It also supports multi-touch pinching for zooming but due to the size of trackpad, the sensitivity from zoom is too high causing me to zoom in/out too much. Netbooks from Asus (I believe from all Eee’s 900 and up) have multi-touch that support even more functions as shown in the video below. Being able to press both left and right mouse buttons at the same time is also desirable as pressing them together can be recognized as a middle click, so stay away from those singular buttons that rock left or right for button presses. Good mouse button tactile feedback is desirable as it helps provide physical feedback that the button is pressed enhancing user experience. Some netbooks give you and option to change out the regular hard disk drive (HDD) for a solid state drive (SSD) which will give you better reliability and performance but as SSD’s are newer technology they cost more and also they cannot store as much data as HDD’s. SSD’s have no physical moving parts thus it is less likely for failure and is resistant to possible drive damage from the mobility of a netbook. With any mobile device, users need to be careful not to make any sudden movements with the device, especially when in operation, as the hard drive head could damage platters that the data is stored on (when not in operation the HDD head should be parked in a safe place). If you choose an HDD, a faster spinning drive will help improve performance thus drives with 5400 RPM or higher would be desirable. Some of cheap promotions of netbooks use a 3-cell battery instead of a 6-cell battery. This causes battery-life to be around 2 hours which is fine but if you want true mobility and use of your netbook I believe the added weight of a 6-cell battery is well worth it. 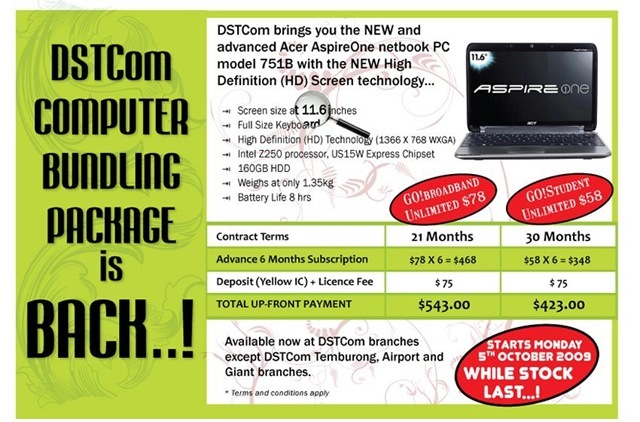 Do check out Laptop Magazine’s website for their battery tests on any netbook you are looking at. If you are planning to use the netbook for presentations a normal VGA output is necessary. Some netbooks have non-VGA outputs but have a dongle / connector to convert it to a VGA output, while it is good it is another thing you would have to remember and not lose. Just keep it simple and get a netbook with a VGA output. You don’t want to arrive at the presentation venue only to find out you misplaced your dongle and end up scrambling to get the presentation on another computer. 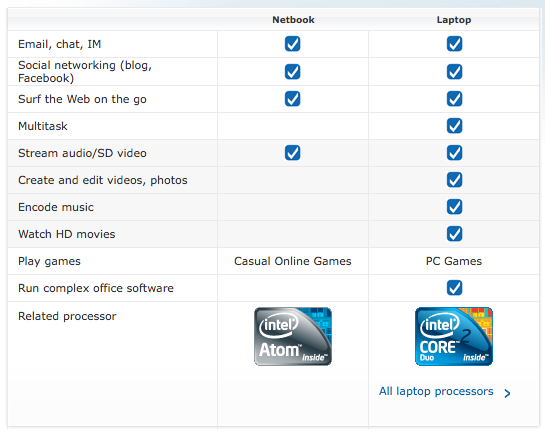 If you plan on playing some games and watching HD video, check out netbooks with NVIDIA’s ION chip in it. The HP Mini 311 is equipped with it and even has a HDMI output. While netbooks should typically be able to play most 720p video, NVIDIA ION lets it play 1080p video and games like Call of Duty 4 / Left for Dead / Counter-Strike Source. Game settings will have to be turned down but for light gaming it’s perfect. Note: 720p H264 MP4 files play a bit choppy on my N270 equipped Acer Aspire One, but the 720p WMV videos from Microsoft play fine. Let it be known that Flash video in HD (e.g. YouTube) by default will not work well on netbooks as Flash utilizes the CPU to process and play the video. A possible workaround to this is to download the Flash video and play it through a media application (e.g. Windows Media Player / Media Player classic) and it would provide smoother playback vs playing in the web browser via Flash. Good codec’s are also necessary to the optimal experience and CoreAVC is recommended for H264 video playback (e.g. YouTube HD video / most video podcasts). Flash version 10.1 (that isn’t released publicly yet) can utilize the graphics card via GPU acceleration and when combined with NVIDIA ION allows smooth Flash video (720p and 1080p) as shown below. Typical users will stick to Windows and for the sake of performance (especially w/ multi-monitors), I would recommend Windows. Though I do love Linux, the performance of a standard Ubuntu Netbook Remix (UNR) install isn’t as good as Windows XP. Windows 7, although better and faster than Vista, is still slower than XP and performance-wise still edges out UNR. Bootable SD card slot: having an SD card slot that you can boot directly from is a great feature that lets you try different Linux distros at the change of an SD card and also makes a great recovery method. To make this even more usable, ensure that the SD card will be flush with the device when inserted and not sticking out. Don’t believe the FUD that Intel is spreading. Technically netbooks can do everything a regular laptop can do, but basically it has a slower processor leading to slower performance. One of the reason Intel could be doing this is to bring up market share of more expensive laptops with the more expensive Core 2 processor from Intel: basically netbooks are cannibalizing the laptop/notebook market and with netbooks having lower profit margins Intel has everything to gain by pushing more people to buy a laptop compared to a netbook. Take a look at the comments over at JKK Mobile on this same chart. JKK himself says he has edited over 40 videos and all his photos on his Asus Eee PC. I believe in user education and once users understand that Atom processors are just slower than you ‘average’ processor they should not expect everything out of it. There is no technical reason netbooks cannot multitask, create and edit videos, photos, encode music, watch HD movies or run complex office software as indicated by the absence of ticks in the netbook column. Basically Atom can do all these things just slowly or with conditions. With ION the “Watch HD movies” is out of the question; albeit this comparison was done before ION was generally available but 720p videos could still be viewed before ION thus you could still watch HD movies just not full HD. “Multitasking” is certainly do-able on a netbook and as with any computer / notebook today it depends mostly on the RAM and what types of applications you are running. Video and Photo creation/editing can be done on netbooks, though screen size may hamper it, and the processor may make applying filters/effects/transitions slower but again it can be done. HD video editing would be out of the question but normal VGA (640×480) video that most digital cameras record to should be fine. Encoding music: same thing, can be done but slower, but now with ION video and audio transcoding can be accelerated greatly. For the “Run complex office software” entry I just have to laugh at that, as how complex can office software get? Microsoft Office runs fine on a netbook. Open Office runs fine on a netbook. For most people I don’t think they do any CPU intensive actions on office documents so a netbook is still a good choice. The biggest thing about netbooks has to be their convenience factor: they are small, light and their good battery life makes them even more enticing to bring along with you wherever you go without weighing you down like a regular notebook would. What I love about netbooks is that it makes it even more accessible for people to user computers. No longer are the days that you need at least B$1000 to get a decent computer, these netbooks can cost half of that price and they are getting mobility and usability that hasn’t seen the day of light until now.